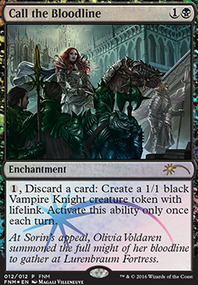 , Discard a card: Create a 1/1 black Vampire knight token with lifelink. Activate this ability only once per turn. Ok, a few suggestions. As per the description you state you want graveyard shenanigans, and im assuming that's in reference to Haakon, Stromgald Scourge. I have my own variation of this deck: Knighty-knight that you could take a look at that does just tha. Looking over your deck list, I see some tweaks that should be made if this is a direction you want to go. First off, you only have one outlet to easily get Haakon into the graveyard that I can see in Buried Alive. I'd recommend a few more to facilitate some consistency. Entomb & Final Parting both work like Buried alive and Peace of Mind , Call the Bloodline , and Markov Dreadknight are discard outlets for if you draw Haakon. You should be getting some value from this recursion other than knights that wont go away. Door of Destinies is a great anthem effect that gets bigger with each spell. On top of this, there are spells like Nameless Inversion , Crib Swap , and Shields of Velis Vel that have changeling. Which means that they are Knights while in your graveyard. Haakon will allow you to play these spells over and over again. Last suggestion is relating to your equipment package. I'm not against running equipment, but i'm certainly not a fan. However, there is one equipment that I am surprised is not being run more often and thats Kusari-Gama . Such a great effect that can punish an opponent when forced to block. 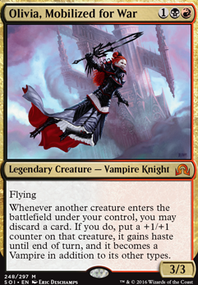 The overall combination is definitely better suited to a commander deck, especially under Markov since you can make use of all three major vampire colors and the Bloodlord of Vaasgoth , which plays all kinds of dirty with vampire tokens. Regarding Keeper, the buff it provides is monstrous if you can get it flipped, but I don't especially care for it in a R/B Madness deck due to its low to the ground and swing nature -- Keeper is a much more midrange-y card, and I certainly recommend it more in a token based deck, alongside the Aristocrat. When it comes to the Gorger, granting Madness to your other creatures is a hell of an upside, but in my testing I've found it is more difficult to plan around than I'd like, since you often don't have one in your opening hand, and they are extremely easy to kill. It's one of the major reasons I've been toying around with the Neonate again, just for a second one drop in the deck for more consistent turn 1 pressure. I don't think I mentioned it before, but Call the Bloodline is another interesting option; I don't like it for a traditional red/black Madness deck, but it is quite nasty in a mono-black control variant I run alongside things like the Voldaren Pariah Flip, Murderous Compulsion , and Dark Withering -- you might look into that with how black heavy your list is, especially since you can work in Psychotic Episode for some Madness handhate and make better use of the Highborn, Condemned, and Captivating Vampire you are running. Personally, I don't like the rate on Banewhip Punisher , Oathsworn Vampire (It's just really bad Bloodghast ), Sadistic Skymarcher , Tragic Poet , Foul-Tongue Shriek , Chalice of Life Flip, Fountain of Renewal , Bishop of the Bloodstained (Anthems and Sanctum Seeker will just be a lot more damage over the course of a game), Ravenous Chupacabra , Profane Procession Flip, or Underworld Connections . They're all just very low impact in a 40-life, 4-player format, with the exception of the last two. Profane Procession Flip is just so much more expensive than something like Rise of the Dark Realms , and while you're not the first person I've talked to who seems to think Underworld Connections is an acceptable substitute for Phyrexian Arena , man is it ever worse. I don't like the rate on Call the Bloodline , either, unless you want to go deeper on a Madness or Reanimator theme, which could work, since you might want Voldaren Pariah Flip, anyway. If you did that, Call to the Netherworld gets back Elenda, Big Game Hunter is a nice replacement for Banewhip Punisher , Bishop of Rebirth could be decent, and bigger vamps like Nirkana Revenant , Patron of the Vein , Necropolis Regent , Guul Draz Overseer , Vish Kal, Blood Arbiter , and Butcher of Malakir become much more attractive. That would require a lot of changes, though. You could keep Profane Procession Flip and get a lot more out of Crypt of Agadeem that way, though, so maybe don't rule it out. GoldenAgeBatman - Even in a situation where 100% of your hand has Madness, that does not mean you want Tibalt's ability. Magic is not just about playing creatures and spells, it's about playing the right creature or spell for that given moment in the game. For Tibalt to be shine, you have to have not just a hand full of Madness cards, but a hand full of Madness cards that you want to play in that given moment. I just do not see that happening often enough to be relevant. I have been focusing on Tibalt so far, but there's one point I did not mention in earlier posts: it is not enough for Tibalt just to be helpful to the deck (I think I've explained many reasons why I do not think he is helpful to any deck), but he must be more helpful than another card serving the same function. 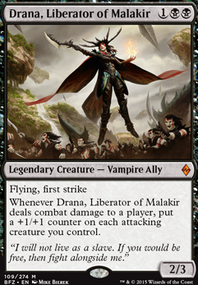 To that end, Tibalt competes directly with Liliana of the Veil for a card slot. Both have a +1 ability that results in no net change in card advantage (Tibalt replaces the card before discard; Liliana causes both players to lose a card). Liliana, however, allows you to choose the card, and her remaining two abilities are better than Tibalt's. Even if Liliana is out of one's pricerange, there are better discard enablers than Tibalt. 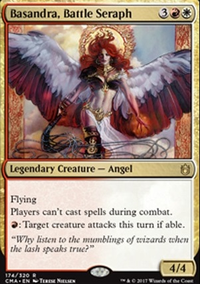 Call the Bloodline , for example, would be a decent option, netting you a 1/1 with lifelink in addition to the ability to choose which card you cast. Further, it can be used at instant speed, allowing you to cheat Madness cards in on your opponent's turn. 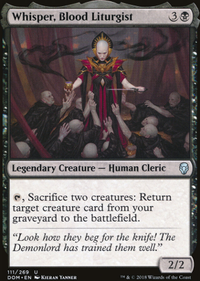 Tibalt does give you the excuse to proclaim "[Opponent's name] the hate I bear thee can afford no better term than this,—thou art a villain" during a match, which would certainty give you style points. Style points, however, do not win matches, and I fear your fate would be the same as the young Capulet's. 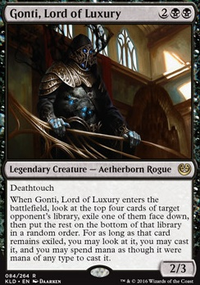 Call the Bloodline could keep ur board always ready to push ur opponents (also lifelink would be useful to keep you alive while going "all in" vs the opp), it could have a nice sinergy with Falkenrath Gorger (pretty insane 2/1 for just 1 mana). Insolent Neonate i gave you could fit in it too. Padbras Well since your going for a more aggro approach, I would cut out the Call the Bloodline since it can be slow and is better suited for a tokens approach. I have a deck similar to this and was never able to make Avacyn's Judgment work since it requires quite a bit of mana to really be effective, so I would cut those as well. 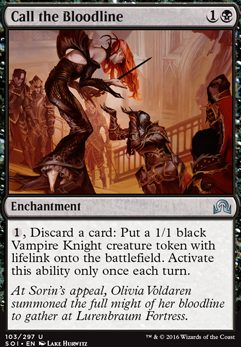 Not sure how good Incorrigible Youths, Olivia's Bloodsworn and Furyblade Vampire have been for you, but you might look at cutting some of them. You should really think about adding a 4th Falkenrath Gorger as well, since giving all your vampires Madness is something you want to do every game. Being able to string Falkenrath Gorger into Stromkirk Condemned and Madnessing in Stromkirk Captain on turn three while attacking for 8 First Strike damage can really put you ahead and possibly set you up for a turn 4 win. Also Unclaimed Territory is a relatively cheap way to fix your mana base. Tortured Existence: discarding creatures is not something we wanna do, right? Still - not bad. Stromkirk Condemned - I was thinking about it. Can be useful..sometimes. Land's Edge well... If I could target a creature instead of player will be good to add here. Call the Bloodline I've added it here if you remember. Too bad that I can use it only once per turn. I will ask my friend. He has bah-roken discard deck in modern. Maybe he has something to say about it. Will dig the gatherer too.